Paul exhorts us to think like Jesus then describes his own pursuit of the high calling available in Christ, something he did not view himself as having attained when he wrote this later in his life. So we have something to pursue and it requires thinking like Jesus, laying down our agendas and picking up His – just as He laid down His desires and picked up His Father’s. I believe part of thinking like Jesus and having His mind is attending to what Paul wrote. We need to replace fear and worry with faith and intercession, bringing our specific requests before the throne of grace and leaving them with Him. When we do His peace will guard our hearts and minds. To stay in that place we need to meditate (think deeply and reflectively) on that which is noble, just, pure, lovely, virtuous and praiseworthy. This is how Jesus thought. Part of thinking about things that are just is praying for Yahweh’s justice in the earth. Seeing His justice is also noble, pure, lovely, virtuous and praiseworthy for when we have His justice made manifest we have everything else because He is fair and just. As Abraham said, “Shall not the judge of all the earth do right?” (Gen. 18:25). Isaiah described it this way. Part of thinking like Jesus is praying for His justice to be made manifest in the earth so that our world will finally become righteous under His rule and reign. I believe that thinking like Jesus involves embracing the whole counsel of God and this is the fruit of maturity. At present many in His body embrace one facet of truth to the exclusion of others. When we think like Jesus we embrace it all as Paul wrote. In this statement in 1 Corinthians, though it may offend us, I believe Paul is saying we can assess our spiritual maturity by how we think. All of us as Christians have access to Jesus way of thinking. The mature are those who use that access to change their thinking to conform to His. When we do this we are practicing what the scriptures teach. Paul said we were to imitate Jesus and also to imitate or follow him the same way in which he followed Christ. They both embraced the whole counsel of God. A noble goal as we seek to grow in Christlikeness this year. I want to delve a bit into the passage below to give us yet another way to look at what it means to be in Christ and for Christ to be in us. Bear in mind that a metaphor is a message and we need to only get from it what the Lord has put into it. All metaphors break down at some point if we move beyond the message. Branches cannot move in an out of a vine, yet there is a sense in which while if we are born again we are in Jesus, we can choose whether or not to abide. The message of the metaphor below is fruitfulness, not conversion. In this metaphor to be fruitful we must be abiding. So what images does the word abiding evoke? We can think of living somewhere, however living and abiding may be two different things. We can live somewhere and not ‘abide’ because abiding carries the idea of being settled or being at home where we live. When Jesus says ‘abide in me’ He is asking us to settle down and be comfortable with Him, like a branch well connected to a vine. While Jesus desires that we abide in Him, He also desires to be comfortable in us. This pattern of us in Him and Him in us is replayed for us earlier in John 14. Things are sometimes lost in translation. The verses below are a good example. These verses are part of a longer teaching by Jesus and what is lost is that in verse 2 the word ‘mansions’ and the word ‘home’ in verse 23 are the same word in Greek. These are the only two occurrences of the word in the New Testament and the meaning of the word is place, dwelling, stay or abide (the first version of the NKJV had ‘dwelling places’ in it, as the NASB does now) Jesus wasn’t telling the apostles that by going to the cross He was going to go to heaven and take up home building. His sacrifice, death and resurrection were creating a dwelling place for them in heaven in Him and if the apostles (and by extension us) kept His word He would abide in them. So in Jesus use of the vine metaphor we see that a grape branch produces fruit by dwelling or abiding, by being connected to and drawing life from the vine, the source. As we learn to abide, to live in Jesus (us in Christ) we draw on Him and His life flows through us (Christ in us) and fruit is produced. We abide in Him by learning to be at rest in Him and His word and the fruit flows forth brings glory to our Father. Another important part Jesus addresses is pruning. Yes, it involves cutting. Have you ever looked at a branch on a tree or vine that has a lot of leaves but no fruit? It may look good but not only is it of no real value to the gardener, it is in fact drawing life from the vine that is being consumed on itself but producing nothing. These branches are useless and need to be removed so that the life that is going into them can be redirected to fruitful branches. The other thing Jesus addressed in verse 2 was the ‘taking away’ of branches that have no fruit. This may seem to refer to pruning but Jesus clearly addressed pruning later. The alternate rendering in my bible is ‘lift up.’ This seems to better capture what Jesus is communicating. If you look at vineyards you see the vines are all staked so that the branches are raised up off the ground to fruit. Jesus seems to be saying is that if a branch is laying in the dirt (think carnality or sin) it is unfruitful and needs to be raised up from the dirt to produce fruit. If we are seeking to abide in Him but see no fruit in our lives it may be that we need to come to Him in repentance so that we are lifted up from the dirt and fruit is produced through our life in Him. My prayer is that we as branches will be woven into a beautiful living tapestry that produces much fruit while shining in the Son! In my last post I referenced the scripture below and wrote about how by being in Christ we have access to the throne room and by Jesus being in us He has access through His body to accomplish His purposes in the earth. I now want to look at another aspect of what this means. Many years ago I read a story of a young pastor who was struggling and when he presented his issues to a more mature pastor the older fellow asked him if he was using the armour provided in Ephesians 6. Since he had just graduated from seminary the young man started to describe what each piece meant and began to break down the text. The older man stopped him and essentially said, “I didn’t ask if you could describe it. I asked if you were using it.” A good question! So, below is the armour. Paul tells us we are in a spiritual battle then exhorts us to put on the armour so that we may be victorious in this spiritual warfare that is part of the package of being a Christian. The armour takes us back to the idea of Christ in us and us being in Christ. The tense is important in capturing this. Starting from verse 14 we are told that the first three pieces; the belt of truth, the breastplate of righteousness and the footwear of the gospel of peace, are things we already have by virtue of our conversion. We have them in the present because we received them in the past. In Jesus we have truth (Eph. 4:21, Jn. 14:6), He is our righteousness (1 Cor. 1:30, 2 Cor. 5:21), and He is our peace (Eph. 2:14, Jn. 14:27). What we need to do is confess and believe these truths. We need them worked into our hearts to see them effective in spiritual battles. Once we recognize this reality we are to then actively take up our shield of faith, our helmet of salvation and our sword, His word, because we are in Christ. The first three pieces of armour, we have in Jesus and they are ours at conversion. The other three pieces we ‘take up’ by working them into our lives. Faith literally shields us from attack and we all have some measure of it at conversion (Rom. 12:3). Through using our faith it grows (Gal. 2:20). The helmet protects our mind and by renewing our mind with His word we begin to have the mind of Christ (Rom. 12:1-2, Phil. 2:5). The sword is His word applied. Paul’s closing point is that as we are engaged in intercession we need to take the scriptures the Holy Spirit quickens to us (praying in the Spirit, or at the leading of the Spirit) and use them. We cannot simply find a scripture to suit our desires, rather we need to submit our desires to His purpose. This is His roadmap to victory. In my last post included a sentence from a written prayer I developed. Here is another portion that demonstrates one way to apply Ephesians 6. I have provided a number of scripture references in this post when I referenced the pieces of armour. I recognize it takes time but I encourage you, look them up and reflect/meditate upon them so they live within you. This is not a recipe for an easy life, rather is the way of discipleship. Remember, there can be no victory without a battle. The battle is before us – will we fight? Have you ever wondered what it means, or what the distinction is between Christ in you and you in Christ? Does it seem like splitting hairs? Do the scriptures mean different things by the different terms? Let’s look at some scriptures and address the question from the perspective of access. The two scriptures above point to the importance of Christ in us and the following ones to us in Christ. The verses above speak of what we have in Jesus. So we have two important aspects, us being in Jesus and Jesus being in us. Jesus addressed this in His last teaching before going to the Garden of Gethsemane then the cross. If we break down the two aspects we can see that addresses our access to throne room. 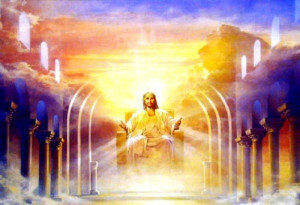 Jesus is seated on the throne and because we are ‘in Him’ we can come boldly to throne of grace because in one sense we are already there (Heb. 4:14-16). The second is that by being in us Jesus has access through us to accomplish His purposes in the earth. While He has received all authority through His death and resurrection He has finished His work and commissioned us for the next phase. We have an incredible responsibility and incredible opportunity if we are sufficiently awakened to our calling to respond. I pray we give Jesus our agendas so that we will see His fulfilled in the earth! If you have read my blog or heard me teach a few times there is a recurring message in a lot of what I say, I talk about sitting with Jesus, sitting in His presence. Why do I do that and how do I do it? The why? I desire to give Jesus the first part of my day as that sets the tone for the rest of my day. If I jump out of bed and frenetically engage in activity I have set the pattern for my day. I get up early in the morning to meet with Jesus for two reasons. One, He is worthy and I need to be with Him. Two, He is to be our pattern and a careful reading of the gospels shows that Jesus began His days getting up early to be with His Father. If Jesus needed to do this to be effective I certainly need to do likewise. Sitting with Jesus is not a contest. The important factor is not whether I spend 5 or 50 minutes with Him, it is important to be at the place where my first desire is to get up and be with Him. This is not the case every day but that is my desire. I know of one well known preacher who speaks of spending the first hour or two of his day worshipping and interacting with Jesus before he gets out of bed. I suspect that pattern would not work for most of us. However most of us can start our day with Him. If for some reason you cannot give Him at least the first few minutes of your day how soon can you get alone with Him? What is your first opportunity? Is it while riding the bus? We can get alone with Him in a crowd of people. While it is not ideal we can use this as an opportunity to train our attention and intention. We are called to be with Him and His desire is to be with us. There is a key focus in both verses below. In both of the above verses there is a task given, however, the priority for both Moses and the twelve was first on ‘being with Him’ before doing anything for Him. Whatever we do for Him is to flow from our relationship with Him. I have included a couple of images below that some of you may find helpful in focusing your hearts upon Him (we can think of one as Jesus and one as our Father). 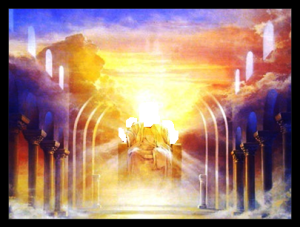 After all the descriptions of His throne in Isaiah, Ezekiel and Revelation are there for some reason! I do some of this although my own experience is that I sense/feel Jesus presence more than I see anything. Often His speaking comes in the form of a scripture, sometimes in the sense to do something like encourage or reach out to someone or to pray for a person or situation. The more frequent outcome of sitting with Him is that I simply experience His presence in and around me and find myself internally more focused and functional because I am very aware of Jesus with me and in me.